Ideally, we need to be open-minded. We belong to a culture which was much more open minded and raising questions and issues when you are logically correct were never considered offensive. It was rather considered the preferred practice to follow. Ancient Indian literature is very rich. And when we talk about it, it is obvious to refer Vedas, Puranas, Ramayana (aka Ramayan) and Mahabharata (aka Mahabharat). Based on various evidence found by the scholars and historians, now almost everyone started believing that Ramayana and Mahabharata are not just mythological tales, they are historical tales. It is quite possible that the original versions of these tales are written in a more realistic manner by documenting historical incident; and, over the period of time legends and superlativeness is added to the fiction making it look more like fantasy stuff. Today, however, we are not going to analyze the historical accuracy of these fictions, but let us try to explore various angles from which Mahabharata was analysed by various authors. Late Harilal Upadhyay (a Gujarati author) have tried to stick to the original popular version of Mahabharat in his Mahabharat book series which is comprised of 7 books. Wellknown mythologist Devdutt Pattanaik came up with Jaya which is an illustrated retelling of Mahabharata where he tried to take a note of some of the less known tales from the epic. Recently Deepak Kaul have tried retelling the Mahabharata as a comic book named Corpokshetra, where the characters are setup in current time. Quite different to them, some authors thought of looking to the epic from a specific character’s point of view. For example Anand Neelakantan, whose debut book, Asura – Tale Of The Vanquished was the exploration of Ramayana from Ravan (aka Ravana)’s perspective; came up with two books series on Mahabharata. He named it Ajaya (the opposite of Jaya – Mahabharata is part of Jaya or JayaSamhita) where he did explore it from Duryodhan (aka Duryodhana)’s point of view. Famous author Chitra Banerjee Diwakaruni have tried exploring Mahabharata from Draupadi’s point of view and named the book as – The Palace Of Illusions. Famous Malayalam author M. T. Vasudevan Nair wrote a book named Randaamoozham which explores the tale of Mahabharata from Bheem (aka Bheema or Bhima or Bhimsen)’s point of view. Randaamoozham became popular among Malayalam readers. Prem Panicker was impressed by retelling of Mahabharata in Randaamoozham and on his blog https://prempanicker.wordpress.com he tried exploring Mahabharata from Bheem’s point of view by keeping Randaamoozham as the base and named it BHIMSEN. Remember BHIMSEN is not translation of Randaamoozham. BHIMSEN was published as a series of articles on Prem Panicker’s blog and once completed, he consolidated it in the form of a PDF and made it available to read for free to everyone! Spread over in 71 chapters, this book is a good read. 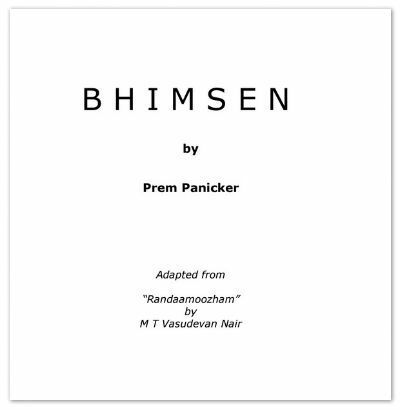 You can download it from Bhimsen by Prem Panicker Book Download Links. Let us take a bird’s eye view to the plot of the book – Bhimsen. As Mahabharata is explored through Bhimsen’s eyes here, it can be started (logically) from the childhood days of him. If the author wanted to refer or explore any incident(s) happened outside of Bhima’s lifetime, he has to write it like – the information was conveyed to Bhima by someone. Bhima, the second Pandav, felt proud whenever he was called the son of Vaayu. Often he stands on his balcony and tries to feel the soothing touch of his father. As his father met with his death, Bhima along with his mother and 4 brothers were summoned to the Palace. He was an innocent boy, who loved his food more than anything. Since an early age, he got to know that his elder brother Yudhisthira have a tendency to talk about Dharma and rules, and often hide his limitations behind those ideas. It is Bhima who needed to be a front-runner in difficult times. He and his younger brother Arjuna were the most competent among 5 Pandavas. Bhima found that Yudhisthira was opportunistic and plays his cards in a way that can give him (Yudhisthira) the benefit. Bhima, however, considers Yudhisthira a good visionary and have the ability to be a competent ruler. The tale moves ahead from Pandava’s childhood to their tussles with Kauravas; the Lakshagriha episode, Bheema’s fights with various challengers, their marriages, their wars, and victories. The things move ahead and the book covers Draupadi’s humiliation and Pandava’s exile in the forest. Ultimately the battle of Kurukshetra was fought and justice delivered. The story moves ahead and ends at a point when they were all on their ultimate destination. Writing anything against the popular version of something is always challenging, and when your target is the Mahabharata, which is almost worshiped by the people; definitely requires a lot of courage. India aka Bharat is a land where you can express your thoughts freely and can question almost anything if you are backed with the logic. Geeta aka Shrimad BhagvadGeeta is nothing else but a Q/A session between Lord Krishna and Arjuna. And though out the book Krishna keeps motivating Arjuna to ask questions and resolve doubts, even if it is very small. This book sees Mahabharata from Bheema’s eye, so there are many things missing from the original epic of Mahabharata. Even the battle of Mahabharata can also be explored from Bheema’s eyes. In this book, there are no mythological characters, no superstitious tales. Each and every character is a human being and portrayed as the same. Bheema himself (actually the author, through Bheema’s mouth) tells that the court poets and street singers will keep adding legends to the stuff happened really and there will be a greater version of a very small incident. The partiality of Drona towards Arjuna was explored nicely, Bheema was good at archery too, but Drona asked him to go for mace, and cleared the path of Arjuna. There are many such things mentioned in the book. Bheema’s thoughts about Pandavas being sons of Gods, Draupadi’s marriage with all 5 of them, his guilt for ignoring his wives and sons (apart from Draupadi); and other stuff is portrayed quite well. And then, said my brother, there was the maha bali, the grand sacrifice where the person who was doing the ritual offered himself up as the final, ultimate sacrifice. This seemed even more pointless: if earning divine blessings was he point of any sacrifice, then why would I go to all these elaborate lengths, only to die at the altar myself? But loving him, respecting him, identifying with his ambition—all of that did not mean I had to agree with everything he said and did, that I had to give up my own principles and embrace his will and his whims—and I was glad of this chance to let him know. Thankfully, they were all crowded together, very close to me, all eager to hurt me – the fools didn’t realize that by attacking me as a crowd, they were only getting in each other’s way. You can let an animal go free, even a dangerous animal, but never let an enemy escape. If you do he becomes doubly strong, and the next time he attacks, you will die. It is when you sympathize with an enemy that you are weakest, most vulnerable; when your foe is down, your dharma is to finish him, to end it. Animals have an extraordinarily sharp sense for fear – they can smell it on you even before you sense it in yourselves. The first order of business when preparing for war is to set up the cremation ground. Its location determines so much else – you don’t want to site the army’s tents too close, nor can it be located so far that the process of mourning the day’s dead and attending to their last rites becomes too time-consuming, keeping soldiers from their rest. I couldn’t help thinking that our real problem was not the Kauravas but the bitterness each of us had accumulated over the years. … when fear swamps your senses, the techniques you had learnt are always the first casualty. The book has several proofreading issues. He had over time reconciled to the war, to those we had killed and those we had lost, and had plunged into the task f recruiting and training fresh soldiers for our army. You will find use of various popular Malayalam phrases like cherryamma, achan and others. It gives a little regional flavor to the book. The incident when Bheema meets Dhritrashtra after the Mahabharata war when Dhritrashtra was to hug him; is missing from the book. It is probably one incident which must have been included. Prem Panicker has read and studied many books written on the topic and he mentions what he like in which and what not. It is a good gesture. If you can read something mythological with an open mind and if you have the tendency to logically challenge beliefs and admire literary qualities. You will enjoy this book. It is worth to note that famous Malayalam actor Mohanlal announced a film based on “Randaamoozham” and the budget of the film is to be 1000 crore INR! In fact, when there were controversies around it, Indian Prime Minister have backed the project (Ref India Today Article. Even there were new that S. S. Rajamouli is interested in making a film based on “Randaamoozham” and there are several fan made trailers are available on YouTube.